In Ayurveda diseases divided in to two part according to their sources. According to Ayurveda injury is known as vrana. So scar mark appear due injury are categorized with agantooj rog (external causes). There are so many herbs and plant are mentioned in Ayurveda having wound healing properties known as vranaropka. Minor skin injuries, skin infections, burns, surgery, acne, insect bites, weight gain or pregnancy, overexposure to sun rays. Non-irritant, easily absorbed into the skin. Specifically designed to reduce the appearance of scars – quickly and efficiently. Herbal pack supplies the necessary nourishment to the skin cells as it deeply penetrates into the subcutaneous tissues and muscles enabling the melanin forming cells to act according to the climatic conditions. Thus enabling them to stop the over action of these cells which results in dark spots or scar marks. Digest and eliminates excess scar tissue. Activates the skin’s own regeneration process. Decrease visibility of scars with continued use, scar reduction, scar flattening, an increase in skin smoothness, and an overall increase in skin hydration. Regular use of this product also prevents the formation of freckles, brown spots, hyper pigmentation and sk. Restores the lost shine and glow of skin internally by blood purifying process, encourage healing from within. Proven herbs get beneath the skin’s surface to heal skin at the source. Contains specific nutrients that are not easily obtained from dietary sources alone that influence. Herbal Skin Supplement & its natural herbs helps to balance all three body humor or doshas. Herbs in it work to naturally cleanse, purify and detoxify the body and help promote a clearer complexion. Promotes additional collagen growth – which gradually stimulates the skin’s return to a normal. Internal Skin Supplements in the capsule form target the areas inside your body where imbalance. Intake: Consume Supplement (1 capsule) once a day with milk or any other. Most users feel a noticeable difference after just ONE MONTH!. Also dramatically improves the appearance of healthy skin. Although very little can be done to reduce the appearance of deep, long term scars, surgical scars. These types of scars can never be completely removed and treatments will always leave a trace. Though dramatic improvement in these scars can be accomplished with regular use of this Treatment. While treatment will work on new and existing scars, best results are possible with scars that are less than two years old since scars actively heal for about two years. Atrophic scars lie below the surrounding skin tissue level. These small depressions are produced when insufficient new connective tissue fibers are formed during the healing process. Typical atrophic scars are acne scars. Acute acne and cystic acne can leave a trail of scars, redness and irritation in its path. Our Treatment would Soften and fade the appearance of acne scars. Reduces the appearance of ACNE scar by up to 60% – 82% with results seen in as little as four weeks. Average scar lightening/fading period ranging between 2-3 months depending on the affected area. Scars caused by surgical incisions can leave lasting reminders of painful injuries or surgeries. These types of scars are reddened, painful and raised. Reduces the appearance of surgery scar by up to 30% – 40%. Average scar lightening/fading period ranging between 2-6 months depending on the affected area. A laceration may damage underlying structures; for example nerves, tendons, or muscle. Any laceration will leave some scar tissue behind & generally has a reddened and raised appearance. Amazing Herbal Scar Removal Treatment can be used to treat the scar, reduce itching and discomfort and improve its appearance. Reduces the appearance of these scars by up to 55% – 67%. Average scar lightening/fading period ranging between 2-6 months depending on the affected area. It also helps to prevent stretch marks from forming in the first place. Reduces the appearance of stretch marks by up to 59% – 65%. Average scar lightening/fading period ranging between 2-6 months depending on the affected area. The morphological characteristic of a hypertrophic scar is the excessive formation of the scar, due to an increased number of collagenous fibres. Bulgy, connective tissue raises above the surrounding skin level, however limited to the original wound area. Immature hypertrophic scars show a reddish coloring and tend to be itchy, mature recognized by their thick, raised and discolored appearance. Amazing Herbal Scar Removal Treatment can be used on newly formed hypertrophic scars, as well as older scars. It reduces the thickened, discolored and raised appearance of the scar. Reduces the appearance of hypertrophic scar by up to 59% – 65%. Average scar lightening/fading period ranging between 2-6 months depending on the affected area. Keloids often develop long after the wound healing has been concluded. Surplus production of connective tissue fibers is so excessive that it causes the scar to spread widely beyond the original wound area onto healthy skin. Keloids have a reddish coloring and they itch, burn, prickle and can often be painful. The disposition towards scar keloids is often genetic and increasing numbers of young women are being affected, they are often found on the chest, ears or shoulders. Amazing Herbal Scar Removal Treatment can be used on newly formed keloidal scars, as well as older scars. It reduces the thickened, discolored and raised appearance of the scar. It also helps relieve itching or discomfort associated with keloidal scars. Reduces the appearance of Keloidal Scars by up to 59% – 63%. Average scar lightening/fading period ranging between 2-6 months depending on the affected area. Scars caused by burns are often red, raised, and sometimes painful or itchy. 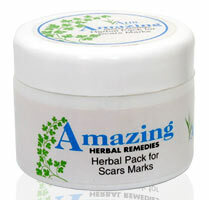 Once the burned area has healed, Amazing Herbal Scar Treatment can be used on scars left by burns. It will help to fade the redness and reduce the raised appearance of the scar. Reduces the appearance of burn scars by up to 45% – 52%. Average scar lightening/fading period ranging between 2-6 months depending on the affected area. Insect bites, and the scratching that often accompanies them, can lead to scarring of surrounding skin. Scars from insect bites are frequently red, raised and itchy. 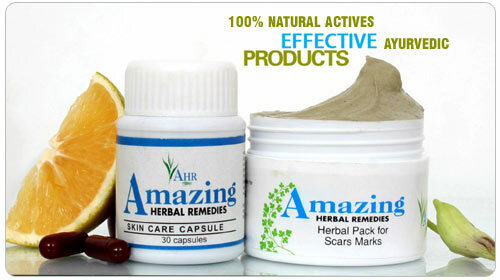 Amazing Herbal Scar Treatment can be used on scars left by insect bites. It helps relieve itching or discomfort associated with insect bites, while helping to fade the redness and reduce the raised appearance of the scar. Scars are embarrassing; sometimes people start feeling low self-esteem, embarrassment in mixing with others, loose confidence, and even become irritating. There’s a lot you can do on your own to supplement your treatment. Given below are some of the simplest and effective tips in order to get rid of these embarrassing marks & can be key to faster recovery along with the treatment. One should always live happy and stress free. Sunbath is also very good. One should not use chemical soaps for skin, medicated soaps, rosewater etc., are good for the skin. Applying ice cubes over the skin also help in removing the dark pigments and scars. Yoga and exercises is very good for health. One should go for morning and evening walk, do different breathing exercises and yogaasanas. There are not particular yoga posture which help directly in reducing scar marks but some posture according to yoga which help in toning skin and help in radiant look skin by balancing dosha’s status in body. The fish pose gives a good stretch to your back & neck, regular practice also reduce throat ailments and improves skin texture, gives radiant look, moves emotions & stress are regulated. Lie flat on the back in the shava-asana. Keeping the buttocks on the floor, inhale and raise the head, shoulders, back and upper arms off the floor arching the back and raising the chest up. Tilt the head back and place the top of the head flat on the floor. Raise the elbows off the floor bring your hands up just below the chest and join them at the palms with the fingers pointing straight up (form the anjali-mudra or salutation hand gesture). Hold for the duration of the inhale breath or breath gently through the nostrils to remain in the posture longer. Eating healthy and nutritional foods are essential to keep body and mind healthy. Person with scars, dark patches should eat plenty of green vegetables, fruits, cereals, salads etc. One should also drink 8-10 glasses of water everyday & cutting out caffeine can significantly help in making your skin healthier. Similarly, freshly prepared fruit juice is also very good for health. Junk food, oily and fatty foods should be strictly avoided. Oily foods tend to produce harmful chemicals in the body and hence result in skin pigmentation. Acupressure Points for Relieving Acne, Pimple and Other Skin Problems. Points (A) – Heavenly Pillar Location: One-half inch below the base of the skuIl on the ropy muscles one-half inch outward from either side of the spine. Benefits: Relieves stress related to skin disorders such as acne. Relieves stress, burnout, exhaustion, insomnia, heaviness in the head, eyestrain, stiff necks, and sore throats. Points (B) & Points (C) – Sea of Vitality Caution: Do not press on disintegrating discs or fractured or broken bones. If you have a weak back, a few minutes of stationary, light touching instead of pressure can be very healing. See your doctor first if you have any questions or need medical advice. Location: In the lower back (between the second and third lumbar vertebrae) two to four finger widths away from the spine at waist level. Benefits: Relieves acne, eczema, and bruises on the body. Lemon juice: The citric nature of lemon helps in cleaning the skin and removing any kind of scar. Apply lemon juice over the effected skin, or rub lemon over the skin by cutting it in two half. Tomato: Similarly, tomato juice extract is also good for curing scars. Apply freshly prepared tomato juice over the effected area, or simply rub tomato over the skin by cutting it in two pieces. Margossa leaves: Similarly, margossa or neem leaves are also very good for treating different skin diseases. scars especially due to chicken pox or pimples are easily cured by neem leaves. 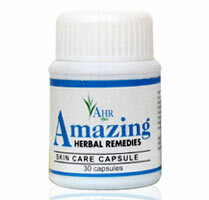 Apply neem-leaf extract over the effected area 2-3 times a day till the scar is not removed completely. Mint leaves: Mint leaves are very good for removing ark circles, pimple marks, acne scars, etc. Take 10-15 pudina leaves and wash them. Take them in a perforated clean cotton cloth and extract mint leaf juice. Apply this juice extract over the effected area. Cucumber: Cucumber extract is also very good in removing dark scars. Apply cucumber extract over the effected area and keep for 5-10 minutes and wash it off. Do this 2-3 times a day until the scar is not removed completely. Banana: Mash ripe banana and apply over the effected skin. Allow it to dry for 5-7 minutes and then wash it off. This entry was posted in Clinic Remedies and tagged Acne, Ayurveda, Herbal, Home Remedies, Hypertrophic Scar, Keloidal Scars, Pregnancy, Stretch Marks, Surgery, Yoga.